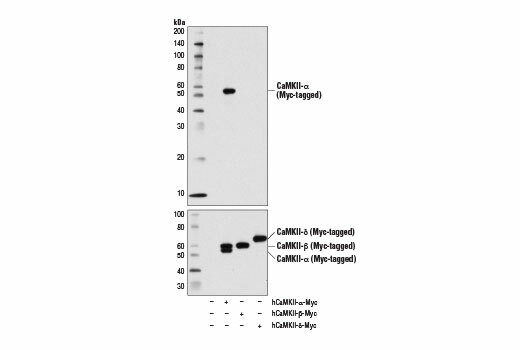 Western blot analysis of extracts from 293T cells, mock transfected (-) or transfected with a construct expressing Myc-tagged full-length human CaMKII-α protein (hCaMKII-α-Myc; +), CaMKII-β protein (hCaMKII-β-Myc; +), or CaMKII-δ protein (hCaMKII-δ-Myc; +), using CaMKII-α (6G9) Mouse mAb (upper) and Myc-Tag (71D10) Rabbit mAb #2278 (lower). Western blot analysis of extracts from various tissues using CaMKII-α (6G9) Mouse mAb (upper) and β-Actin (D6A8) Rabbit mAb #8457 (lower). 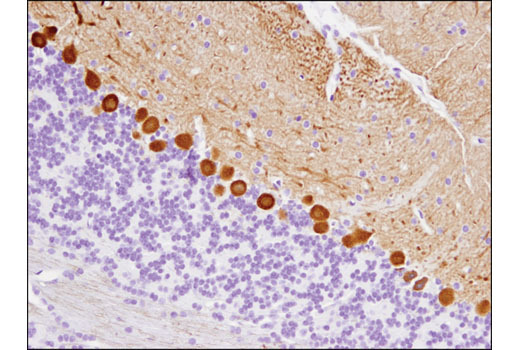 Immunohistochemical analysis of paraffin-embedded mouse cerebellum using CaMKII-α (6G9) Mouse mAb. 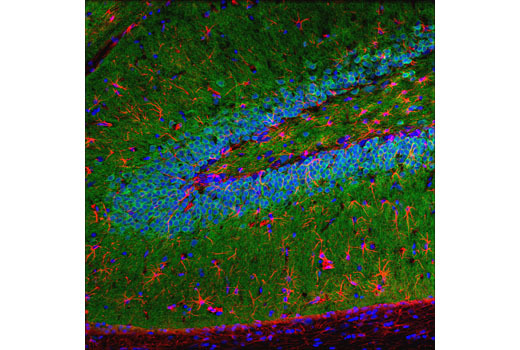 Confocal immunofluorescent analysis of rat brain using CaMKII-α (6G9) Mouse mAb (green). 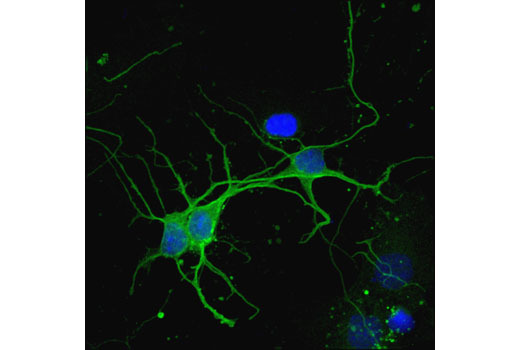 Glial cells were labeled with GFAP (D1F4Q) XP® Rabbit mAb #12389 (red). Blue pseudocolor = DRAQ5® #4084 (fluorescent DNA dye). Confocal immunofluorescent analysis of mouse primary neurons using CaMKII-α (6G9) Mouse mAb (green). Blue pseudocolor = DRAQ5® #4084 (fluorescent DNA dye). Methanol Permeabilization Step: Cover tissue sections with ice-cold 100% methanol (use enough to cover completely to a depth of 3–5 mm, DO NOT LET DRY), incubate in methanol for 10 minutes at –20°C, rinse in 1X PBS for 5 minutes. CaMKII-α (6G9) Mouse mAb recognizes endogenous levels of total CaMKII-α protein. 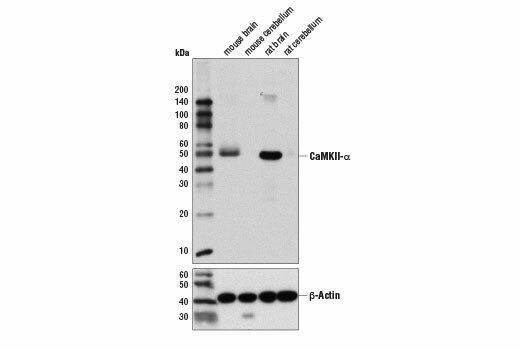 This antibody does not cross-react with CaMKII-β or CaMKII-δ proteins. Monoclonal antibody is produced by immunizing animals with a partially purified rat CaMKII-α protein.